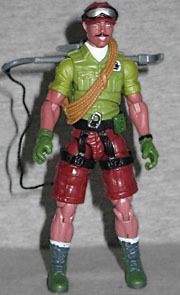 Alpine (real name: Albert Pine) didn't often appear in the comics, but since he was a 1985 figure, he was a mainstay in the cartoon. And while there was already a Generation 3 Alpine, it was only available in a rare box set, so most fans never had a chance at him. Rather than do a pointless minimal update of that figure (like they did for Hit & Run), the Club did something new: they updated one of Alpine's Generation 2 designs! From the middle of the flat dusty Snake River Plain where Alpine was born, he could see the mountains on the horizon in almost every direction, like a physical barrier between him and the world he wanted. He took up mountain climbing during college and continued as a recreational climber during his brief tenure as an accountant for a large publishing firm. Seeking more meaningful ascensions, he joined the Army, trained at Mountain Warfare School, Camp Ethan Allen and graduated Ranger School, Fort Benning. 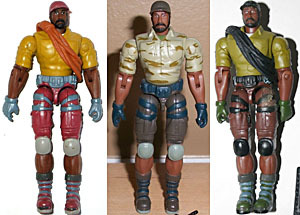 He was quickly recruited into the GI Joe team, where his unique specialty could be put to more important use. Alpine scales mountains piton by piton, overcoming granite and gravity with pure muscle and persistence. That's why the team sends him up first on all vertical assaults. He truly enjoys the challenge of the most hazardous of all conditions, climbing sheer cliffs, in unfavorable weather, weighted [sic] down by gear, with Cobra shooting at him! They (meaning both Hasbro and the GI Joe Collectors' Club) have made G2 characters before - Barrel Roll, Wide Scope, the utter load that was Sure Fire - but this is only the second figure to give us a G1 character in his G2 clothes. 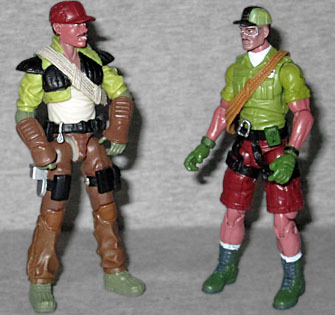 As introduced during Valor vs. Venom, Alpine was wearing a plain, button-down shirt and a pair of cargo shorts; to re-create that look, we get the torso from the Retaliation box set Firefly, and the legs and upper arms from Kwinn the Eskimo. The climbing harness that loops around his waist and thighs originally belonged to Airborne, which makes sense. Not sure who the forearms and gloved hands come from - they could have been used for nearly anyone. The head, however, is new. It's a Boss Fight Studios sculpt, and looks more like the original Alpine than the VvV version. He has a mustache rather than a full beard, and he's wearing his complex hat with the ridge over the top, not just a plain ballcap. He's got a big cheesy grin, suiting the character you know from the cartoon. He's wearing his goggles on his forehead rather than over his eyes, but this is a very vintage Alpine head. 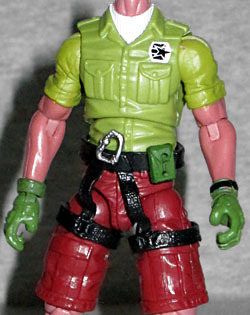 The Generation 2 Alpine mold was used three times, each in a different colorscheme: the first, in a two-pack with Swamp-Rat, had a yellow shirt and red shorts; another was in Tiger Force colors; but this figure is based on the single-carded figure, with its green shirt and brown shorts (closer to Al's '80s color, and thus, more likely to pass the squint test). He moves at the ankles, knees, hips, torso, wrists, elbows, shoulders, and neck. If you want to swap the heads between this Alpine and the Best of '80s Episodes one, the balljoints are nearly identical diameters - only the colors on the new head will mark it as not belonging on that body. Alpine's accessories include a SOPMOD M4A1, an HK MP7, a rope to loop around his chest, and the same backpack, pick, and grappling hook as the last Alpine, just done in new colors. 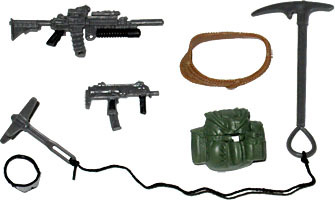 Other than the SMG, these are equivalent to the things the 2004 figure came with, so they're nice choices. I didn't care much about Alpine when he was announced for FSS 3.0, but having him in-hand, he's a lot of fun. No, it's not the classic design, but it proves that updating Generation 2 versions of G1 characters to current (Generation 3) standards can work, and it can work well. This opens up an entirely new and fertile ground for future A Real American Hero toys, one that we hope to see Hasbro take advantage of. It's a lot more interesting than "let's do the same thing, but bigger!"